The very first jazzman that became a Meritorious Artist of Russian Soviet Federative Socialist Republic and then a People’s Artist of Russia. State Prize of the Russian Federation Laureate, Various jazz music festivals laureate (in Prague, Bombay, Havana, Warsaw, Finland, Israel). Union of Composers Member, Union of Cinematographers Member, Academician of Nika Film Academy. Companion of the Order of Merit for the Fatherland (4th class), Order of Honor. All big events in the Soviet and Russian jazz culture will always remain twinned with George Garanyan. His first professional work was Oleg Lundstrem Orchestra. It was a team of Russian musicians from Shanghai that wanted to come back to their native land. The orchestra was determined to get this young and talented man and therefore opened a vacancy for the sixth saxophonist. 45 years later Oleg Lundstrem passed George Garanyan his stick and the circle was closed. But at first George Garanyan had to use all his persistence for being at the right time and place and trying to release all his potential. Almost all Soviet composers came to Garanyan after he became the head of the Melodia ensemble. They knew that he could bring them success. When he worked as a State Symphony Cinema Orchestra conductor, the same thing happened. He recorded soundtracks for The Irony of Fate, The Adventures ofBurotino and The Twelve Choirs. He created and arranged music for The Pokrovsky Gate, Recipe of Her Youth and A Girl from Rouen Nicknamed Doughnut. Everyone knows his excellent collaboration with director Eugeny Ginzburg in a musical show The Magic Lantern awarded in Switzerland for its soundtrack. One of George’s tricks was the Krasnodar Big Band. He became its leader in 1998 and made a stunning performance in Moscow three months later. 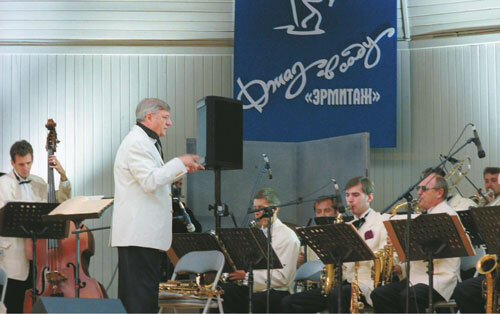 An authoritative music critic Anatoly Agamirov called Krasnodar jazz «the most professional jazz in the Soviet Union and Russia over its history». But George Garanyan stepped even further. In December 2006 he invited the Gnessin State Musical College graduates to take place in George Garanyan Big Band. And he succeeded again! Musicians achieved their full potential and became vivid personalities, great improvisators and virtuosic musicians. There was a time when the Soviet media called George Garanyan «a long-haired mod in extremely tight trousers and an extravagant jacket». But in the end he won recognition from Russian journalists as the best propagandist of jazz in the country. His activity demanded a lot of energy. Live performances took almost all his time so he couldn’t compose more music. But George Garanyan didn’t complain. And in this case a famous joke «there is no wedding without a bayan, there is no playing without Garanyan» is almost absolutely true.